The space available for safety engineering and the time allotted to wiring equipment as diverse as machine tools, packaging machines and food production systems are steadily decreasing. 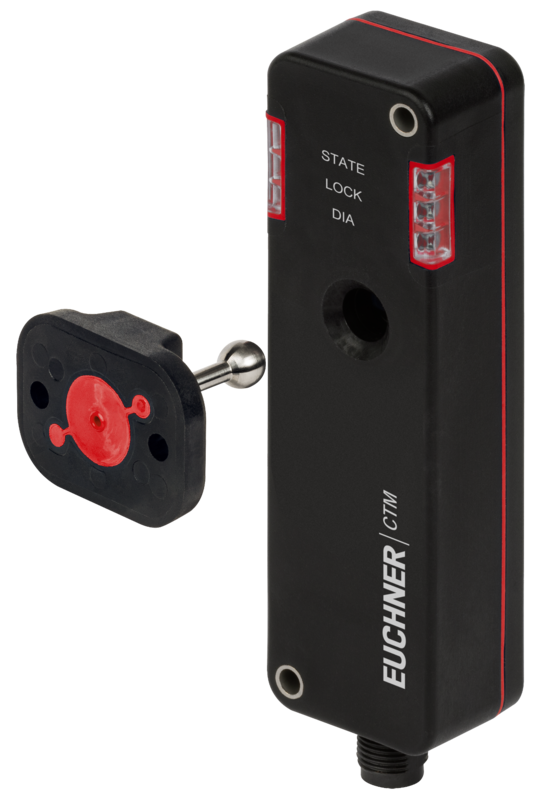 EUCHNER is therefore supplementing its product range with a compact, transponder-coded door locking mechanism designed for use on small, lightweight doors and flaps. Thanks to its compact dimensions of 120 x 36 x 25 mm, the door locking mechanism CTM is particularly simple to integrate into the machine design. The innovative ball actuator supported on an elastomer bearing can secure doors with extremely small pivoting radii. This type of guard locking offers maximum flexibility to the design engineer. The bistable guard locking function of the new safety switch CTM ensures that guard locking remains in its momentary state if the power fails or the installation is switched off. In other words: a locked door will stay locked if it was locked before, or it can be opened and closed as needed if guard locking was not previously activated. People can therefore no longer be locked in unintentionally if the power should fail. The CTM’s intelligent communication capabilities future-proof it for Industry 4.0. It can simply be connected in series with other EUCHNER devices, for example. The integrated interface additionally permits connection to the new EUCHNER evaluation unit ESM-CB, which then forwards the data via IO-Link to the higher-level control system. Safety specialists at EUCHNER have complemented the standard CTM with a hygienic version for use in the food industry. This version consists exclusively of food-safe materials; all plastics are approved according to EU Regulation (EC) No. 10/2011, for example. This version features smooth surfaces, rounded edges, and materials resistant to cleaning agents, making it particularly suitable for use in the food and packaging industries.